In my previous post, I talked about the love triangle between Hong Jong Hyun, Nana and Yura. While Hong Jong Hyun and Nana rumors gradually die down after some time, on the other hand Hong Jong Hyun has been openly interacting with his virtual wife in We Got Married. Therefore, in this post I will gossip about the connection between Hong Jong Hyun and Girl's Day Yura. 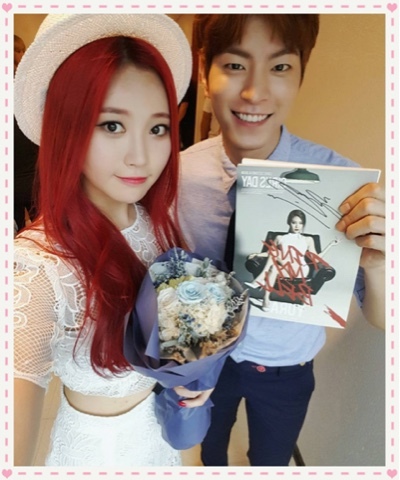 Hong Jong Hyun and Yura met for the first time onscreen after We Got Married. Hong Jong Hyun is one of the MC at Inkigaeyo. Yura being a member of Girl's Day came to the music show to promote their latest comeback single - Ring my bell. Hong Jong Hyun looked very happy to see Yura and he can't help grinning from ear to ear. Although Hong Jong Hyun still cannot look at Yura in the eyes without being shy, he managed to steal a glance at Yura from time to time. 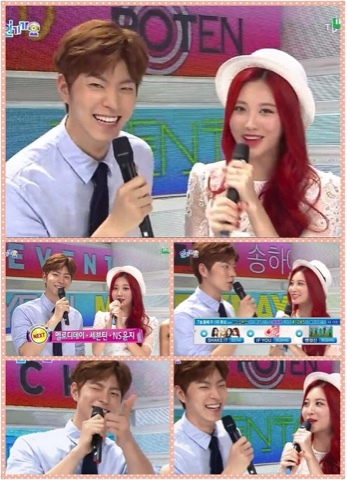 I like how the atmosphere became more cheerful and energetic whenever Yura appears with Hong Jong Hyun onscreen. There must be some telepathic between the two of them as Yura mentioned about his coincidental run-in with Hong Jong Hyun when Yura and Sojin went to eat melon bingsu (shave ice). What are the chances of this type of coincidental run-in? Anyway, Yura said that they greeted each other cheerily. Yura also said that Hong Jong Hyun will treat them (Girl's Day) well. In an interview, Yura was given the question, "If Hong Jong Hyun invited you for date, what will you do? Flustered, Yura bashfully said that it depends on how Jjiong oopa confess his feelings. On the other hand, Hong Jong Hyun expressed surprised at Yura response during an interview. He bashfully said that he and Yura will figure it out by themselves. Is it a hint that, they can develop their relationship to something more than just close friends? Yura recently posted a Instagram picture of a selfie with Jjiong oppa. 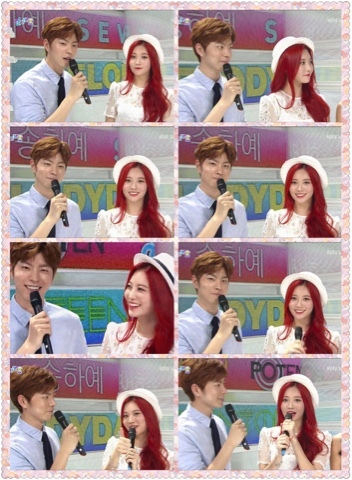 Apparently, Jong Hyun had bought a bouquet of roses to Yura. Those three roses seem to indicate - "I love you." 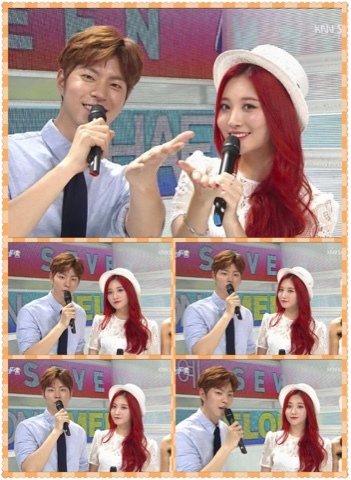 Yura also thank Jong Hyun for the cake which he bought for Girl's Day and specially brought it to their waiting room. In exchange, Yura gave an autographed album of herself posing like Sharon Stone on the CD cover. It is adorable that they started to follow each other at Instagram after Inkigaeyo. How sweet is that? Do you think Jjiongah couple ship is sailing? Which interview did Jong Hyun talk about him and Yura figuring it out by themselves? Despite the fact that WGM is a reality show , but the directors and scriptwriters of this programme is trying to create a personality that they want their cast ( Jong hyun and Yura ) to be. Hence from what I can deduce from his recent actions , It seems that he likes yura . But since it's a make believe show , it's hard for him to express himself truly in front of yura. Especially since the programme wanted viewers to believe that he is less affectionate towards yura. However I feel that it's not the case! Battle of the KFC Wings!